September 12, 2017–The Oak Ridge Chamber of Commerce is busy preparing for its annual Christmas Parade to be held on Saturday, December 9. 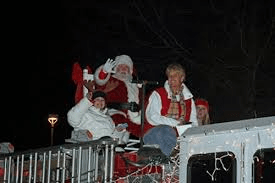 This year’s theme is “A Toyland Christmas: Past 75 Years/Future 75 Years ” and promises to provide spectators with plenty of music, lights and beautiful floats. The parade will be a part of Oak Ridge’s 75th Anniversary Celebration. Sponsor of this year’s parade is The Cowperwood Company. There is no cost to participate. The Chamber will be accepting entries online through Monday, December 4. Register by visiting the Chamber’s website: www.oakridgechamber.org. The parade will start at 6:00 p.m. and will begin at Corporate Center, on the corner of Lafayette and Laboratory Road. From there, the parade will travel down Lafayette to the Oak Ridge Turnpike. It will continue west on the Turnpike to Oak Ridge High School. The judge’s stand will be located in front of the Chamber. The Oak Ridge Chamber of Commerce is Four-Star Accredited Chamber of Commerce.